POETRY4Change | Juliet 'Kego's World of Floetry; Explore! Experience! Enjoy! POETRY4Change Africa: taking poetry from the pages to the streets! A creative platform featuring the works of talented and exciting new poetic voices within the African continent and in the Diaspora. It is an initiative created by Whole WoMan Network’s co-founder, Juliet Kego Ume-Onyido, in partnership with Praxis Magazine Online. The mission is to channel the power of VOICE for societal change, by supporting and empowering Africans to use the tool of written poetry and spoken word to create awareness and proffer solutions for social issues on the continent. POETRY4Change Africa has the following elements: quarterly contests with cash prizes and an annual residency program which involves – networking, mentorship & training programs to hone participants’ writing craft, and their performance, entrepreneurial and leadership skills. It would also include social advocacy, scholarships and grants to support these creative artists, especially artists who fall under the PLWDS spectrum. ― Maya Angelou | I Know Why the Caged Bird Sings. 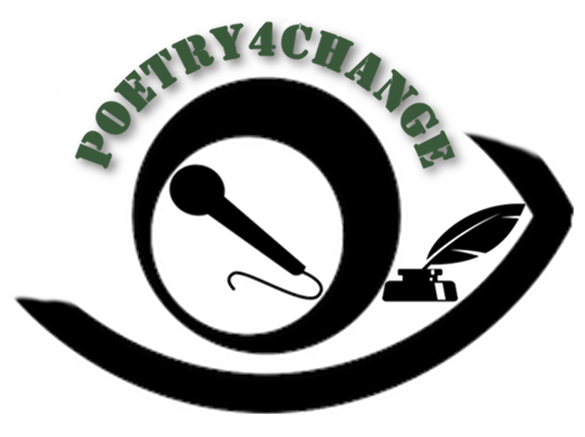 According to Juliet, three different core events inspired the Poetry4Change Platform. On Oct 9, 2012, a young Pakistani girl was shot at on a school bus by al queda terrorist. She would later survive the attack. On December 16, 2012, a young Indian girl was ganged-raped on a bus. She would die from the injuries. “I remembers how visceral the first two events had hit me and the sheer hopelessness I felt. When I hear the news of the third incident, it affected me like a cut to the soul. To think that this horrific event had happened in my homeland, Nigeria. I remember vividly that I was sitting in a Panera coffee-shop in Mississuaga, Ontario, when I read the news. And instead of hopelessness, I realized that it was a fiery rage that enveloped me. A vibrating anger that this could happen, and to such many number of girls. To me, the worst part was that they had been in a school, an otherwise safe haven or so we thought! In order to process my rage, I started scribbling poetic verses about these girls and so many others like them, -women and girls I had known, read or heard about over the years. The poem: “TODAY I WILL NOT BOW [Together WE Rise]” was born. Over the next few months, I started sharing it with friends, groups and organization, in a bid to raise awareness for the challenges faced by girls and women, especially in developing, under-served communities. And in this journey, I came to an awareness that to fight injustice, rather than being helpless and angry, we can choose to channel our rage into an alchemy of compassion and service to others, so that the cycle of injustice and inequality is broken. As a leadership/development consultant, poetry is now integrated in all my workshops and training programs -an opportunity for girls to use poetry/spoken word to share experiences, about their challenges and to celebrate their triumphs, and thus build up self confidence, a spirit of solidarity and empowerment. These workshops are springboards for creating pragmatic and organic solutions for many salient themes that affect the participants. Till date, the poem- “TODAY, I WILL NOT BOW”, has been translated to 17 Languages and recited & performed by groups of school girls worldwide. ALL monies raised from public and private recitals of this poem, both by myself and other individuals/groups continue to support Scholarships, Grants, Micro-loans and Educational/Entrepreneurial training programs in the Arts, STEM, Leadership & Social Enterprise, all of which benefit girls across Africa. I truly believe that the real shift in inequality across Africa will happen when we educate and empower the Girl-Child with the tools/skills she needs to thrive. And we must also include the boys in this conversation, for sustainability and to address the roots. Thus, it is critical to create safe spaces that allow youths, especially girls find and use their voices. Girls should be encouraged to be aware of their values, enforce their personal boundaries, shatter the glass ceilings and also shatter the silence around gender discrimination, abuse and inequality. Formal education and training, mentorship, grants and scholarships, are all very practical ways to change the narrative around inequality all across Africa. In 2015/16 we empowered a total of 350 girls; we are scaling up and the goal for 2017 is for 3,000 girls.